Originally constructed in 1793 by Simeon Lowell, Lowell's Boat Shop is the oldest, continually operating boat shop in the United States. Simeon Lowell is generally credited as the designer and builder of the American dory. The dory was renowned for its seaworthiness and served as the typical American fishing boat for inshore and offshore fisheries throughout the 19th century and well into the mid-20th century. The dory was also the first type of American small boat to be mass-produced on a small scale by Simeon Lowell and his descendents. Thus, Lowell's Boat Shop is also considered one of the Nation's first mass production builders, manufacturing more than 2,000 boats in a single year. 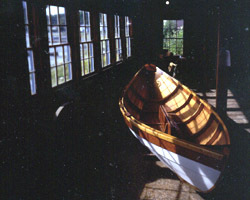 The original boat shop is a two-and-one-half-story, rectangular, wood frame building. Historically, the first floor served as a paint shop, the second floor was used to build the boats, and the timber was dried and stored in the half-story loft. Another boat shop, constructed in 1806, was moved and attached to the original shop in 1860. In 1946, a single-story, wood frame showroom and single-story, wood frame office were added to the existing building as business steadily increased through the end of World War II. 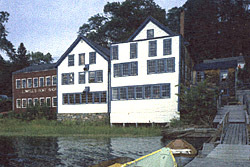 Lowell's Boat Shop remained in the Lowell family until 1976. The Newburyport Maritime Society acquired the entire building and many historic artifacts including boat patterns and specialized tools in 1994. Lowell's Boat Shop, a National Historic Landmark, is located at 459 Main St. in Amesbury. It is owned and maintained by the Newburyport Maritime Society, a nonprofit organization dedicated to preserving and interpreting the maritime heritage of the lower Merrimack Valley. Lowell's Boat Shop serves as a working museum and a training ground for boat builders. It is open Memorial Day through Labor Day, Tuesday-Sunday, 11:00am to 4:00pm, or by appointment. For further information on classes offered and special events call 978-834-0050 or visit the boat shop's website at www.lowellsboatshop.com. Lowell's Boat Shop has also been documented by the National Park Service Historic American Engineering Record.